Kicking off on June 23, we’re calling this experiment the Summer Code Party. It’s an invite for anyone who wants to teach — or learn — webmaking to spend a few minutes building something with friends. Like the Product (Red) campaign, it’s a big tent for anyone who shares our goal of a more web literate planet. Tumblr. Girls Learning Code. Soundcloud. CoderDojo. Creative Commons. etc. Over a dozen partners are already signed up. The most basic version of participation: do a small Hackasaurus project with two friends around your kitchen table or in your living room. Taking a cue from Jess and Atul’s LoveBomb prototype, we’re developing half a dozen small starter projects that will make this easy. Of course, the hope is that people will do this more than once after they’ve tried it — but even a single kitchen table event is a great way to show people how the web works. In addition to Hackasaurus projects, we will also offer up a collection of DIY web projects from partners. 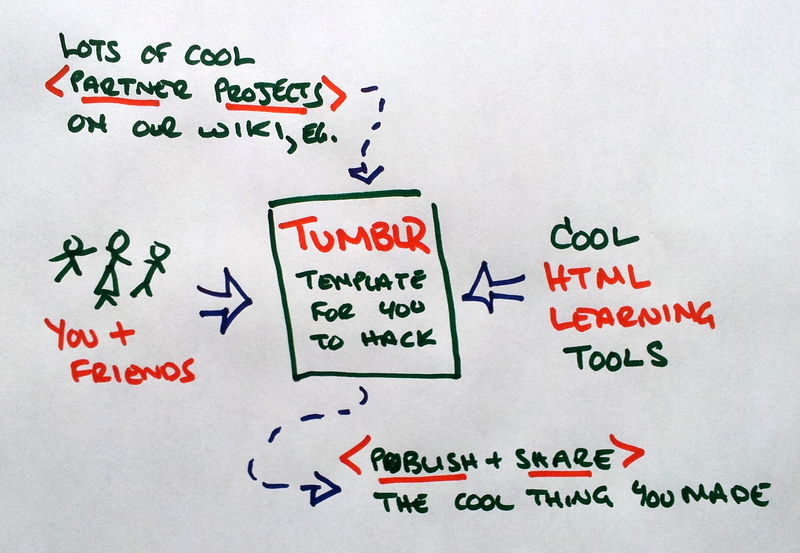 For example, we’re working with Tumblr to develop some well-commented templates that both help people make their Tumblr look cooler and help them improve their HTML and CSS a little. Other partners will be posting their own small projects on our wiki. Some partners are taking on more ambitious projects under the Summer Code Party banner. For example, Girls Learning Code is hoping to offer a week long summer camp at the Mozilla Toronto office. This will cover HTML, CSS, Python and Scratch. Other partners will simply plug their existing summer code efforts into the Party, sharing out what people are learning and making with people around the world doing similar things. Which brings me to how this all fits together: everyone will be invited to share out what they’ve made, both online and at a series of local events in September. The best projects will get badges. And the best local organizers and instructors will get an invite to the Mozilla Festival in London to help us figure out how to improve our webmaking tools and grow out our community. For now, there are three ways to get involved: 1) Put your name of the list of people who want run a small code party at home or in a cafe; 2) Sign up as a partner or collaborator; and 3) Put yourself on the volunteer list for our June 23 and 24 kick off event. Or, if you want to get even more involved, join one of our weekly Webmaker conference calls. They happen every Tuesday. Would love to hear ideas, reactions and partner leads. This should be fun. Well, I didn’t want to over commit on your behalf. Our 1st Hack Jam is June 23rd! and hope to create a celebratory environment as the first day of Summer Code. I’m sure we’ll have something to share afterwards. Looking forward to hearing more. This is not for a party, but I just want to share this: I’ll be teaching a group of immigrant job seekers on how to use webmaking in their job hunt, like using hackasaurus to make HTML resumes.